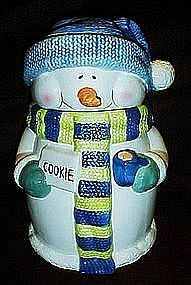 Adorable snowman cookie jar measures over 10" tall. He has rosy cheeks, a crooked carrot nose and a nice warm smile. He wears a cute knitted hat and scarf ensemble of green and blue. He holds a box of cookies and a cup of cocoa. Made by SEI (Smith Enterprises Inc). Made of hand painted ceramic and is in perfect condition.